Thousands of people under “siege” by armed rebels in northern Yemen lack food and healthcare, which has already resulted in deaths and risks killing many more, local leaders and aid workers say. 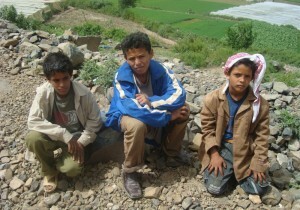 Four children under five have died of hunger since Houthi gunmen cut off access to Dammaj village more than a month ago, Ahmad al-Qurashi, of the local NGO Seyaj Organization for Childhood Protection (SEYAJ), told IRIN. The village, 9km southeast of Sa’ada City, the capital of Sa’ada governorate, is home to about 12,000 people. The area is controlled by the rebels but is home to an institute for Islamic Salafi teachings, Dar al-Hadith, which is at the centre of the conflict. Up to 200 other children are at high risk due to the lack of food, water and medical supplies, according to Hussein al-Hajouri, a spokesman for Dar al-Hadith. They could die if aid organizations are not allowed access, he said. Three elderly men have also died because they could not obtain their regular medication, according to the local independent news website, Sahafah.net. An armed conflict between the Houthi rebels, who belong to an extreme Shi’a sect of Islam, and Salafi residents of the town, who subscribe to the fundamentalist Sunni branch of Islam taught at Dar al-Hadith, has now killed 30 people and injured dozens more since it erupted in the final week of October, according to Dhaifallah Solaiman, a local council member from Sa’ada. On 3 December, SEYAJ made a humanitarian appeal to save the lives of some 3,000 children stranded in Dammaj. A team with the International Committee of the Red Cross (ICRC) was finally able to enter the area on 2 December to provide urgently needed humanitarian assistance, said communication coordinator Rabab al-Rifai. According to Al-Rifai, the initial assistance consisted of 500 rations of food, which included wheat grain, rice, beans, sugar, salt and cooking oil. The ICRC also provided medical items – dressing kits, intravenous fluids, painkillers and antibiotics – and several people were transferred to hospital for treatment. In view of the cold winter, the ICRC also made available 1,000 blankets, soap and nappies to help improve hygiene conditions. Complicating matters further, the stranded civilians say they cannot use the wheat grains they received from ICRC because of a lack of fuel in their village. Sectarian tensions between the Shi’a Houthis and the Salafi students have existed for years, with each trying to spread their ideology in the area. Politics are also at play. The rebels support the popular uprising against President Ali Abdullah Saleh, while the Salafis believe that a ruler must be obeyed and respected and have issued edicts banning protests. But according to the local weekly Yemen Times, the current conflict surfaced last month after a letter, written by Yahya al-Hajouri, head of Dar al-Hadith, was leaked to the Houthis. The letter expressed thanks to both the Yemeni and Saudi governments for fighting the Houthis in 2009. The Houthis attacked Dar al-Hadith and residential homes suspected of housing armed Salafis. The latter fired back. The Houthis then resorted to heavy artillery and banned entry and exit from the village. Dar al-Hadith is run by a hard-core Salafi group and teaches about 7,000 students, including women and children, from Yemen and foreign nations. Mohammed Abdussalam, a spokesman for the Houthis, accused Salafi students at Dar al-Hadith of attacking them from time to time. “They have been attempting to take over strategic military positions outside their area,” he said. The Houthis have been waging attacks and provoking war inside Yemen since 2004.